Digital Acoustics flexible IP7 Series Products power the most demanding intercom and paging applications. Voice-quality audio is delivered over Ethernet/IP in local area (LAN) and wide area networks (WAN). The series’ modular, IP edge-device design provides for superior scalability in applications of all sizes--assuring success today and in the future. The IP7-SE8 model features a powerful 8 Watt Audio Amplifier with Power-over-Ethernet (PoE) convenience. Designed for noisy environments, the SE8 offers a rich set of features to allow for both paging and 2-way audio. With PoE, no extra wires for power are required, just a CAT5 Cable and a PoE Injector or Switch, are all you need. The SE8 also features an integrated 2-port Ethernet switch to allow for daisy-chain installations, or applications where only a single network drop is available. External I/O and relays are part of the IP7-SE8 feature set, allowing for external sensors and relays to be integrated for monitoring and access control. For example a motion sensor could be integrated to trigger a video camera or alert security personnel. A relay (normally-open or normally-closed) could then be used to open a door or gate. Unlike the SS8 and SS20 which are strictly for paging applications, the SE8 offers two-way communication with a Balanced Pseudo-Differential Microphone line-in, and the ability to wire in third party Push-to-Talk (PTT) push buttons as well. Each IP7-SE8 powers one or more speakers in a zone. It also features USB and Ethernet connections for setup and diagnostics For higher output paging applications, try the IP7-SS20 with a 20-watt amp. 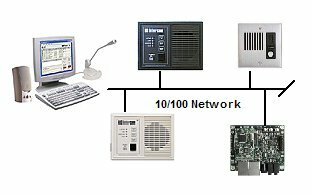 IP Intercom and paging systems can be designed with any combination of intercom endpoints: Desktop Models, Wall/Surface Mount Models, OEM Boards, and/or any of the new IP7 models. 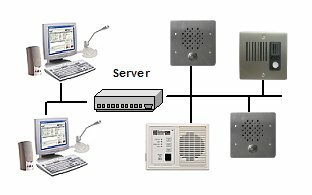 There are two types of IP Intercom systems, paired, or console based. For paired systems, two endpoints can be configured as paired point-to-point units. These two intercoms can talk to each other from anywhere in the world over the Internet. They are configured using the free TalkMaster™ LE Software running on a PC, and once set-up, the PC is removed, and the two endpoints will forever talk to each other exclusively. You can change the configuration later by running TalkMaster LE again. You can have an unlimited number of paired intercoms on the same network - they will not interfere with each other. A console based system, has one or more PC Consoles, communicating with any number of endpoints. Different software is needed to run a single-console system versus a multi-console system. Single-console systems can be implemented using TalkMaster LE Software that comes free with the purchase of any intercom or paging unit. A single-console systems utilizes a PC running Talkmaster LE Software to communicate with IP Intercom/Paging Endpoints. This is a "virtual" star configuration, where all endpoints (intercoms or paging units) report to the console. The console can communicate with any endpoint using the PC's speaker and microphone. Using the Talkmaster GUI (Graphical User Interface), the console operator can initiate or receive calls to/from endpoints. The operator is notified of waiting calls, and customized "please wait" messages can be created for calls waiting in queue. The console operator may also select groups of intercoms and paging units to broadcast a message (for paging or public address). TalkMaster LE software can be loaded on any number of PC's, so the Console can move from one PC to another. In addition, a "warm-standby" can be configured, so that console control can be passed back and forth between two PC's with ease. Multi-console systems require the purchase and installation of TalkMaster™ Enterprise Edition (EE) software. This advanced software allows for multiple, simultaneously active consoles. A server is required to host the Talkmaster-EE Application. This system features real-time call handling, using rules-based queue management. Intercom queues are groups of intercoms that may be assigned to human console operators acting in management teams. To assure service quality, TalkMaster-EE incorporates a powerful set of rules-based controls to handle incoming call counts, waiting time in queue and call priorities. By applying these rules, the TalkMaster-EE Administrator is able to establish call response hierarchies for virtually any organizational requirement. Paired point-to-point with a wall model or desk model (GC-IPIC-EDW) to provide a single intercom pair connection. This is often used to communicate with an entry door or gate to provide audio communications and access control. Used as an intercom/access control endpoint in a multi-intercom application. In this application, a PC Master Console (TalkMaster LE) or Multiple PC Consoles (TalkMaster EE) can control and communicate with a single selected endpoint intercom or paging units, to groups of intercoms/paging units all at once, or to all intercoms and paging units in the installation at the same time. Optional Integrated Dual 10/100 Switch, Relay, Sensor and Audio Line Out. Includes TalkMaster LE PC Software FREE!